Do you know how your kids quit listening when you are screaming at them? Or how you quit hearing someone who is too loud and just get angry and tune them out? Noise. Sometimes we are just noise. I wonder what God feels about noise? Is God Deaf? Then Why Do We Act Like it? I seriously doubt this is what God was looking for, however, sometimes I think that is what we give Him. Is God deaf? Of course not, but sometimes we praise Him as if He is. 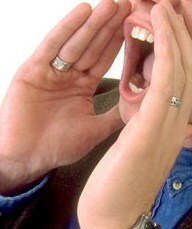 Louder is not always better if the message is lost and we are not drawn closer to the Lord. The Lord and His message should always be the utmost focus of our praise no matter how we are praising. How are we teaching our children to praise the Lord? Everyone is different and they all need to be able to praise Him. The Bible in Basic English translation says, “Make a glad sound to the Lord, all the earth.” Now, that I can relate to. Last night was one of those nights where you hear everything; the distant train, the frogs croaking, the cat stretching. They were all soft sounds, but I heard them all distinct and clear. This morning I went out to work in the yard before the sun hit the area. I heard a dove cooing, a lizard scurrying, a squirrel’s chatter. All soft, but I heard them. I like quiet. Quiet, quiets me. When Jesus went into the Garden of Gethsemane the Bible says in Matthew 26:36-46, that He knelt alone in quiet prayer. When I am praying and praising the Lord, the quieter I get, the more I am praising Him. That is who I am, because I am an outgoing, outspoken person, I need to be quiet to praise the Lord the most. Everyone praises differently. Everything praises the Lord. Niagara is magnificent, but there are more underground streams, babbling brooks, forest and mountain streams then there are magnificent waterfalls. All life praises the Lord. The soaring Eagle praises the Lord, but so does the Hummingbird whose wings are the only sound you hear. Children as they grow learn how to praise the Lord in their own way. Some, unfortunately, are just following their peers. So many are just following the ‘band’ and not the ‘leader’. They talk about ‘the band’ and not the ‘leader’ or His ‘message’. When they go to hear the band they talk only about how good the music was and they never mention the Lord or His message. This is when they have raised a false god and have lost sight of the ‘leader’ and the ‘message’. Encourage your child to praise the Lord in their own way as long as they always hear His message and focus on the Lord. 1 Thessalonians 4:11-1211Make it your ambition to lead a quiet life, to mind your own business and to work with your hands, just as we told you, 12so that your daily life may win the respect of outsiders and so that you will not be dependent on anybody. 1 Peter 3:4 Instead, it should be that of your inner self, the unfading beauty of a gentle and quiet spirit, which is of great worth in God’s sight. “noise.” Merriam-Webster Online Dictionary. 2010.